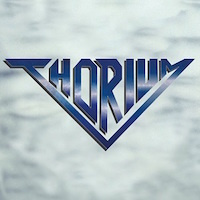 THORIUM is a Heavy Metal based out of Flanders, Belgium and was formed back in 2016. They are currently signed to Rock ‘N’ Growl Records. This is their first full-length released entitled “Thorium” and was released back on October 5th, 2018. The opening track “March of the Eastern Tribe” is an instrumental intro that has some wind effects and some interesting guitar play that reminds me a bit of HELLOWEEN, or the obvious comparison could come in the form of IRON MAIDEN. It sets the stage wonderfully for the very energetic high pitch vocals that follow in “Ostrogoth”, which is somewhat of a cross between BLAZE BAYLEY and PRIMAL FEAR, the influences of both bands is very present, yet it does have its own flavor of pure Heavy/Power Metal with some slower parts. It has some interesting vocal passages and harmonies as well. “Court of Blood” uses some choirs at the start and has an edgier and more old-school approach in the guitars, some cool shredding in the solos. I guess the first band that came to mind when I heard this track was IRON SAVIOR, the vocals are extremely different but musically I do see a tangent here. “Godspeed” has a maiden-like flavor to it in some well-performed guitar harmonies and the structure of the song brings me back to the good old days of “Seventh Son of a Seventh Son” and the choruses are very much akin to AVANTASIA or EDGUY. This is a highly melodic piece, and at first glance, this is my favorite track on the album. “Icons Fall” as a very epic feeling to it, and definitely has that war aspect to it. This is the type of song where we have a storyteller who wishes to tell us about the anguish, the despair and the violence present on a battlefield. It is a very strong song in its message but also its simple and effective approach. “Powder and Arms” is a speedier one, again relying heavily on the melodies, but we get to hear the bass lines a lot better on this one. I do not wish to repeat myself, but we can make the parallels to the epic British metal pioneers on this one as well, which is not a bad thing. How many bands were influenced by NWOBHM legends of the past? There are too many to mention, but it is all about how the songs are performed, and this one has all the makings of being a strong single. “All Manner of Light” slows things down a bit and shows us how the band can also write interesting power ballads, it follows a structure we have heard a million times before in its early stages and transitions into a more power metal aspect. “Return to the Clouds” is a faster juggernaut that could have been released back in the 1980's when Kai Hansen ruled the earth. It would have fit nicely in the “Walls of Jericho” era. Last but not least we have a monster of a last track entitled “Four By Number, Four by Fate” that starts with some acoustic guitars and goes into this medieval-like theme in the guitars, this is the epic track here that shows off the band’s musical talents in different spheres, it follows many different tempos and should please the live crowd. Overall, in a genre that seems to transcend time, certain bands really know how to pull it off, bringing an old recipe in the new era. All the songs here are strong and have memorable choruses. This is a very solid debut; keep an eye out for these guys!